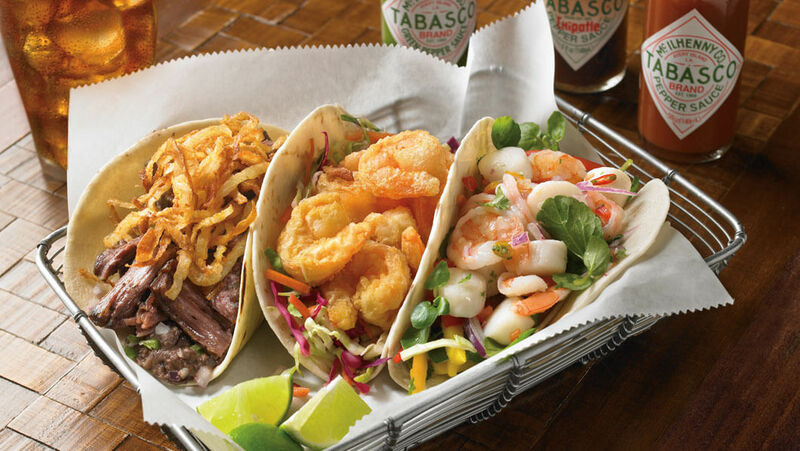 Give diners the variety they crave with this recipe for Soft Tacos 3 Ways: a zesty Mexican-inspired plate featuring shrimp, scallops and short ribs. Tacos are offered on 26% of menus in the U.S. and seafood tacos are one of the fastest-growing taco varieties. Flour tortillas, 6-in. --- 4 ea. Shrimp, fried --- 12 ea. Lime, cut into 4 wedges --- 1 ea. Add TABASCO® Chipotle Sauce to shredded braised short ribs. Fill 4 tortillas with equal amounts of short ribs. Add TABASCO® Green Sauce to fried shrimp. Fill 4 tortillas with equal amounts of shrimp. Garnish with apple cider slaw. Add TABASCO® Sauce to ceviche. Fill 4 tortillas with equal amounts of ceviche. Garnish with watercress salad and lime wedge. Cost Per Serving* $2.97 Total Profit $--.-- *Based on FDA average pricing for ingredients.